Admiral Thomas B. Fargo is a Counselor for the National Bureau of Asian Research. He was the John M. Shalikashvili Chair in National Security Studies at The National Bureau of Asian Research from 2010 to 2016. He is also Chairman of Huntington Ingalls Industries, the United States’ largest military shipbuilder, which was previously a business sector of Northrop Grumman Corporation. Following a distinguished career serving the U.S. Navy and the Department of Defense, Admiral Fargo transitioned to corporate leadership in March 2005, as President of Trex Enterprises, a privately held high-technology company. In April 2008, he became a Managing Director of J.F. Lehman & Company, with principal responsibilities as President and CEO of HSF Holdings/Hawaii Superferry. Admiral Fargo completed his military career as the twentieth officer to hold the position of Commander of the U.S. Pacific Command. As the senior U.S. military commander in East Asia and the Pacific and Indian ocean regions, he led the largest unified command while directing the joint operations of the U.S. Army, Navy, Marine Corps, and Air Force across 100 million miles. He was responsible to the president through the secretary of defense as the U.S. military representative for collective defense arrangements in the Pacific. Admiral Fargo also served as the 29th Commander-in-Chief of the U.S. Pacific Fleet from October 1999 to May 2002. His leadership in the Pacific was preceded by his command of the U.S. Fifth Fleet and Naval Forces of the Central Command during two years of Iraqi contingency operations from July 1996 to July 1998. His 35 years of service included six tours in Washington, D.C., in addition to five commands in the Pacific, Indian Ocean, and Middle East. Born in San Diego, Admiral Fargo attended high school in Coronado, California, and Sasebo, Japan. He graduated from the U.S. Naval Academy in June 1970, and has additional governance, business, and financial training from Harvard and Stanford universities. He is a 1989 recipient of the Vice Admiral James Bond Stockdale Award for Inspirational Leadership. Admiral Fargo serves on the boards of directors of Hawaiian Electric Industries, United States Automobile Association, and Matson, Inc., in addition to smaller private equity and venture capital portfolio companies. 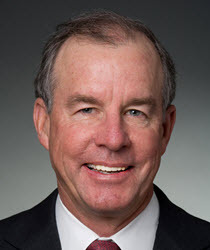 Previously, he served on the boards of Northrop Grumman Corporation, Hawaiian Airlines, and Alexander & Baldwin, Inc. He is also active in his community, serving on the boards of directors of the Japan-America Society of Hawaii and the Friends of Hawaii Charities and on the Iolani School Board of Governors.